The action takes place in Ephesus, in ancient Greece. As the musical opens, an old merchant from Syracuse arrives in Ephesus, a rival city, in search of his long-lost boys – He Had Twins. Coincidentally, one of the sons, Antipholus of Syracuse, and the son’s servant Dromio also arrive in Ephesus. Upon seeing the waste that is Ephesus, Antipholus cannot help but express his longing for his hometown – Dear Old Syracuse. Because of the two Antipholuses’s and two Dromios’s striking resemblances, the Syracusians are soon mistaken for the Ephesians and vice-versa. Things get even more complicated when the two Dromios get confused, with Dromio of Ephesus addressing Antipholus of Syracuse as his master. This Dromio (as compared to that Dromio!) is in real difficulties with Luce, his wife, who complains that he no longer pays attention to her womanly feelings – What Can You Do With A Man? In another part of town, Adriana, the wife of the Ephesian Antipholus, complains to her sister Luciana that she has lost all hope for romance – Falling In Love With Love. As a matter of fact, Antipholus of Ephesus is, at that very moment, arguing with a police sergeant and a goldsmith about the merits of wives and attempting to demonstrate that he is a happy man – The Shortest Day Of The Year. Unbeknownst to him, Adriana has just met Antipholus of Syracuse and, thinking that he is her husband, brings him home. This Antipholus falls for Luciana, who only has eyes for him (This Can’t Be Love), but who avoids him immediately after they have declared themselves. When night falls over Ephesus, Antipholus of Syracuse and his servant Dromio are being cared for by the wives of their respective twins. But when the rightful Ephesians return home, Adriana and Luce chase them away, thinking that they are intruders. The following morning, as the most of the city still sleeps, maids begin their day’s chores by commenting on the courtesans who are returning home – Ladies Of The Evening. Dromio of Syracuse and Luce are early risers: actually, they apparently didn’t sleep much, though Dromio is at a loss to explain Luce’s ardor – He And She. Equally confused is Antipholus of Syracuse, who doesn’t understand why Luciana, obviously in love with him, has let him spend the night with Adriana for whom he feel’s no passion – You Have Cast Your Shadow On The Sea. Meanwhile, Antipholus of Ephesus is also quite perplexed by the odd happenings: not only has his wife locked him out of his own house, but the goldsmith, from whom he has ordered a chain, now claims that he already has given it to him and that he has not yet been paid, and sends the police sergeant to take him to jail – Come With Me. In a mad whirligig, the two Antipholuses and the two Dromios are seen all over the place, creating havoc and adding to everyone’s confusion – The Ballet. The situation has its effects on the women as well: Adriana and Luce are groping for answers that will explain the strange behavior of their “husbands,” while Luciana doesn’t know how to tell her sister that she is in love with Antipholus – Sing For Your Supper. In the street, a courtesan reflects that finding an honest man is not an easy task – Oh, Diogenes. Eventually, of course, the two Antipholuses and the two Dromios find themselves face to face, and “all’s well that ends well,” even for Luciana and her Antipholus, who no longer have to worry about how they feel toward each other – Finale. 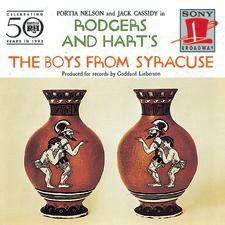 To put on a production of THE BOYS FROM SYRACUSE, Click Here.